Ever wanted to download and import some additional custom POI files to your Navigon Satellite Navigation device (Sat Nav) but are unable to work out how. This is a very simple to use and possibly the only Navigon Custom POI utility that currently allows you to add, search and route to your own POI's direct from the menus on the Navigon Sat Nav device. Adding Custom POI 's on Navigon Devices. Navigon Custom POI was developed for my own personal use as I needed to get my own Custom POI's on to the Navigon unit but could not find anything from Navigon or elsewhere that was user friendly and added the POI's so that they could be searched direct from the Navigon Menu's. Anyway, once I got it all working, I realized it would be really useful to others as well, so have created and posted this web page to share my own solution with you. Navigon Custom POI allow's you to create a set of Custom POI 's from scratch or will do the conversion for you from a correctly formatted and downloaded csv file from the many Custom POI 's files found online for use with Garmin, Tom Tom etc. You may also create and import the Google Earth .kml format from your saved Placemarks. This is a Perfect method for creating local treasure hunts or plotting numerous custom POI's on a map using Google Earth. 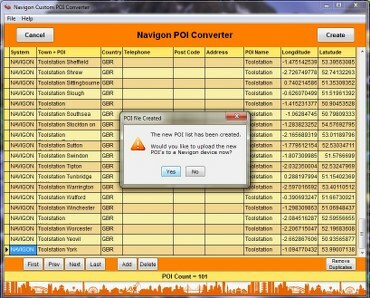 Navigon Custom POI will then convert the .kml files and upload POI's to the Navigon device. 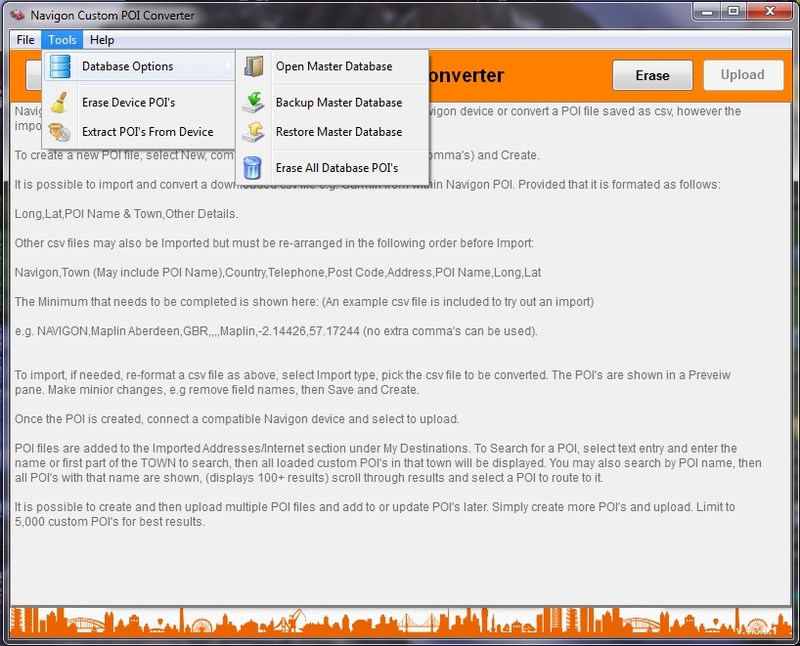 With Navigon Custom POI it is possible to create and then upload multiple POI files and add to or update them later. It is best to limit to around 5,000 custom POI's for the best results. If you intend to add 10,000 or more POI's then this software is not for you! Navigon Custom POI does not use or add to POM or NSF files, even Navigon can't seem to do that. It is also not possible to add warning devices such as Cameras etc with Navigon Custom POI, Navigon provides NAVIGON Safety Camera to do this, so that should be used. Take a Garmin .csv file, that is in a format of - "long, Lat, Town (can include POI Name), Other Details" and then convert it to a Custom set of POI's for the Navigon device. 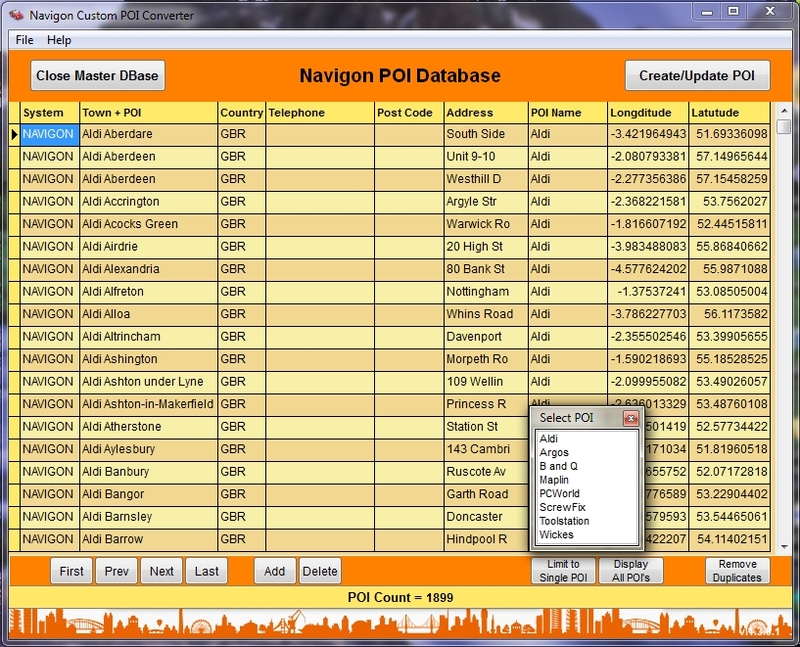 It's quite easy to use, just a few clicks and the custom POI's are then on your Navigon device. The same goes for Google Earth .kml files. Add Placemarks and name them in Google Earth. These will typically contain a Name, Description and Coordinates. If searching by a Town, this must be part of the NAME, e.g. "My POI - London" and if adding an address or a note, this can put this in the description. 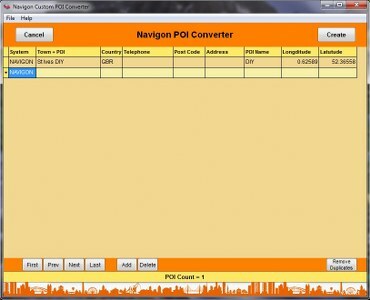 Import to Navigon Custom POI, upload and the custom POI's created are then on your Navigon device. 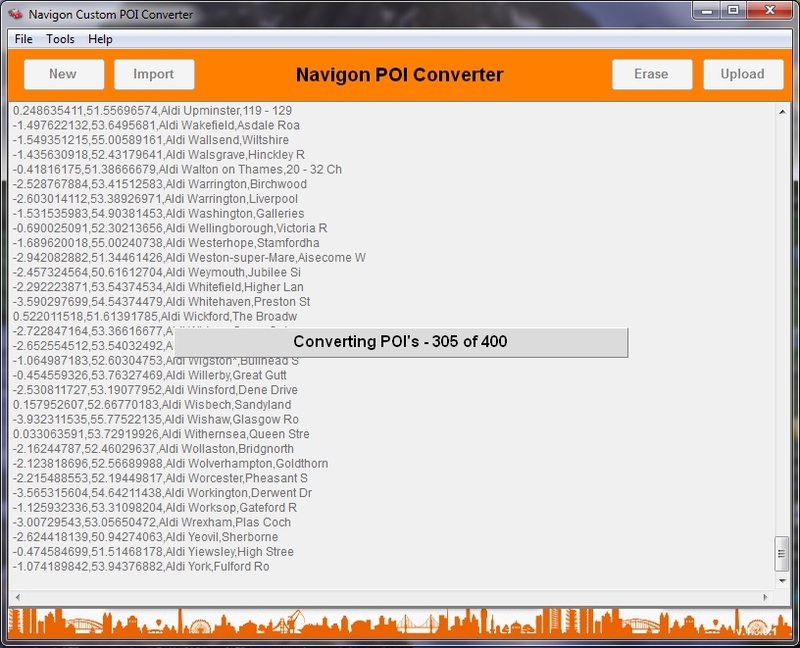 of the Navigon Custom POI Conversion Software in use. Once Created, POI files are added to the Imported Addresses/Internet section under My Destinations. To Search for a POI, select text entry and enter the name or first part of the TOWN to search, then all loaded custom POI's in that town will be displayed, select the POI you want from the results and route to it, could not be easier. It is possible to create and upload multiple POI files and then add to or update POI's later. Limit POI's to 4 or 5 thousand for best results. Please Note: POI Search will not work with Voice Command, as there is just to much data to load. The more POI's there are, the longer it takes to sort and load for searching, this is due to a limitation of the Navigon device. Navigon Custom POI can only be used to search for POI's and not notifications! so it will not add speed alerts etc. No icons are displayed, used or needed as a text based search system is used. Please Note: Navigon Custom POI is only compatible with Navigon devices that have the Imported Addresses: Outlook / Internet Function. 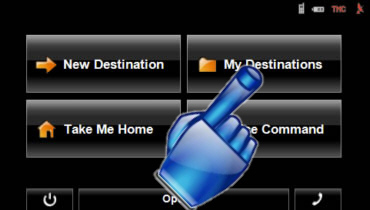 Check for this on the device via the Menu selection > My Destinations > Imported Addresses > Outlook / Internet option. 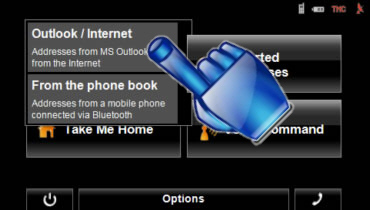 The following screen shot shows the Outlook / Internet function, if the device has this screen, then Navigon Custom POI should work fine. Please check for this function before you decide to download. Please read the following text before you decide to download Navigon Custom POI to find out more about how the Navigon Navigator Smart Phone app, for Android, iphone etc, is restricted in how it navigates to Custom POI's. This is just a simple work around I have come up with but only because I was continually asked if this software works with Android, iphone app's etc? Up until now, the answer has been no. But I have taken a little time to see what I could do to change this and the solution I have come up is explained below. The first thing to note is that Smart Phones, Android, iphone etc with the Navigon Navigator app just has no way to Import Custom POI's. Navigon has always been lacking with this capability! 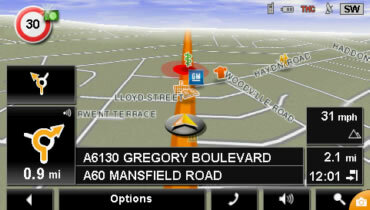 The app can only navigate to a POI from the Navigon Navigator's own default POI categories or to a known address via the phones own contacts list. 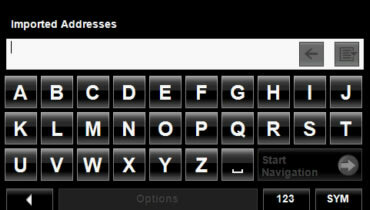 It can then only navigate by using the contacts Post Code or Address. 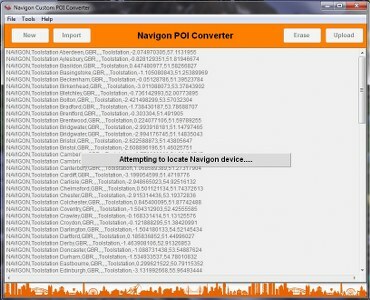 It is just not be possible to navigate to a Custom POI that contains the conventional Long/Lat coordinates as found in a csv file with the Navigon app. Baring this in mind, the only way I could find to add additional POI's, is simply by adding them as a phone contact. Navigon Custom POI can assist with this by creating an Address based POI vcf Card either from scratch or by import of a pre formatted list of addresses. These, lets call them POI Addresses, are then added direct to the phone's contacts or a Google account contacts list. The new POI Addresses can then be accessed from within the Navigon Navigator app for routing. Just like you would for any contacts that have a valid Address and Post Code saved under the phones current contacts list. The Screen shot below shows a list of imported POI Addresses just as they would appear once they have been added to the phones Contacts or a Google account. Here are just a few appreciated remarks I have received. Keep up the good work - your tool makes my life so much easier. 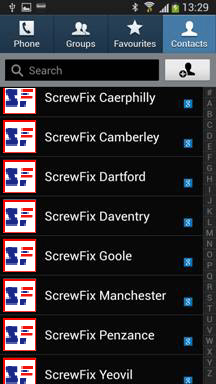 Have finally found some time to play with files on my Sat nav, and I think your application is brill. Looking forward to adding some new POI's to my Navigon now I've found this software. At first glance this looks great - much better than POI Warner, which is what I have been struggling with so far. I do like my Navigon, but not having custom POIs is a nuisance. Until now that is. Been desperately trying to add poi's to Navigon and failing miserably, this is just what I needed. 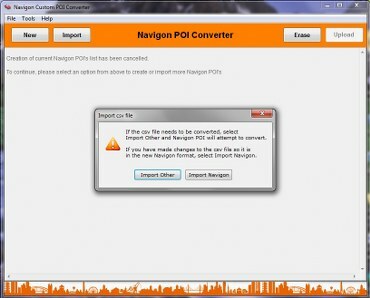 Please now read the answers to some FAQ's before you download Navigon Custom POI. Q - I am asked quite a lot whether Navigon Custom POI uses the POM / NSF format? A - The answer is NO. As far as I'm aware it is not possible to add additional POI's in these formats. Q - Is it possible to add warning devices such as cameras, speed limits etc with Navigon Custom POI. A - Again the answer is NO. Navigon Custom POI can only be used to search for and then route to any Custom POI's. Q - What Navigon Device's will work with Navigon Custom POI? 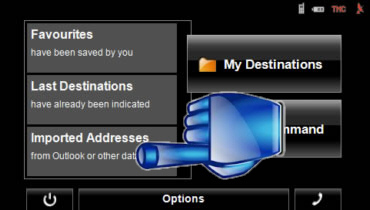 A - The Navigon manufactured devices that have the Menu option of: My Destinations > Imported Addresses > Outlook / Internet. 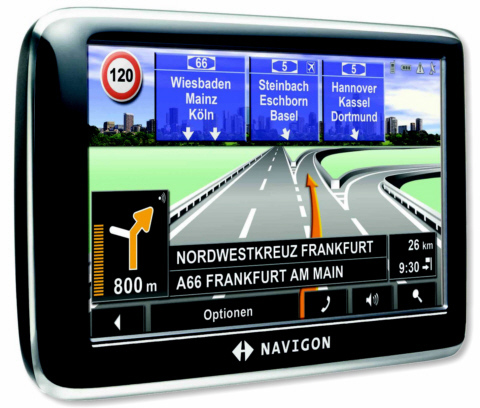 Q - Can I use with Smart Phones, Android, iphone etc Navigon Navigator app? A - Please be aware that the Navigon Navigator app as installed on Smart Phones, Android, iphone etc will not work with POI's that contain Long/Lat coordinates, the app can only route to a valid Address or Post Code. 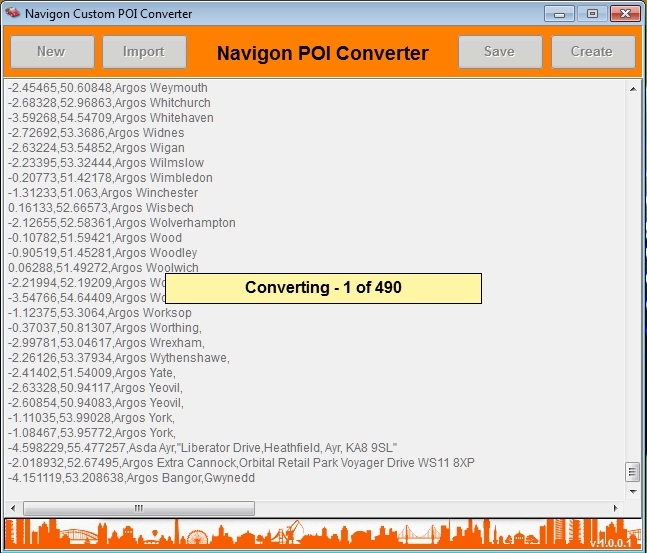 Navigon Custom POI will only assist in the import of address lists (POI Name, Town, Post Code) and then convert them to a vcf card (vCard). 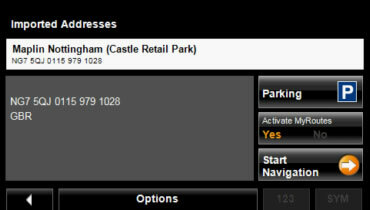 The Navigon Navigator app can then route to the new addresses that have been added to the phones contacts when creating the route. So If you were expecting to be able to add Long/Lat coordinates to a Smart Phone, then you can't because the Navigon Smart Phone app does not support this. 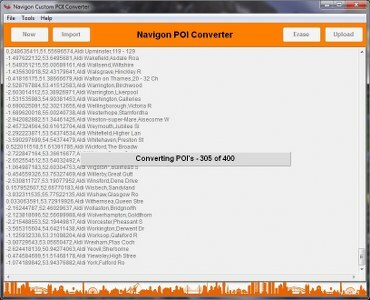 Navigon Custom POI install software is contained in a downloadable zip file and is provided "as-is," without any express or implied warranty, documentation,example files are all included as is full install/un-install. It is fully compatible with Windows XP, Windows Vista, Windows 7 and Windows 8. In no event shall the author be held liable for any damages arising from the use of this software. Please click on the car below to start the Navigon Custom POI download process. There is a small donation, it's less than a nice cup of coffee, this helps cover my web page hosting costs. however registration will remove the reg screen and entitles the user to future updates.